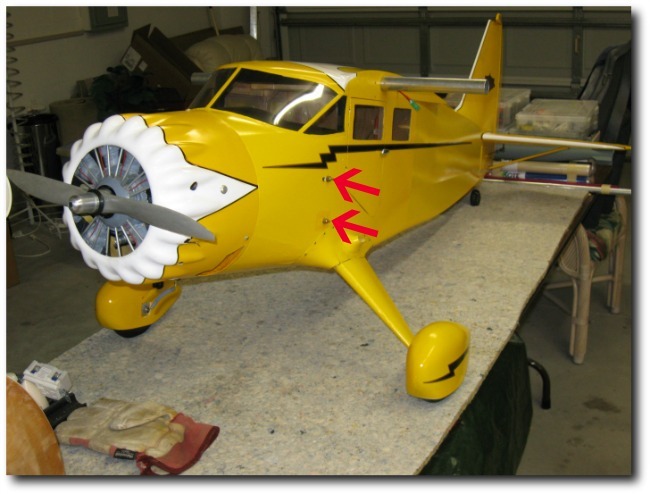 RC Model Airplane Kits: The Top Flite Stinson Reliant. 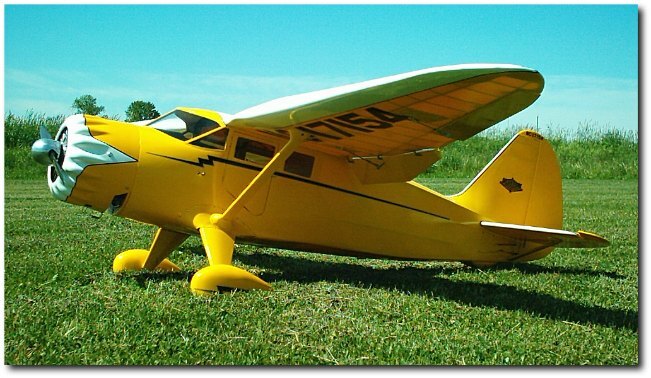 Top Flite are offering RC model airplane kits & the Stinson Reliant is a gorgeous giant scale RC model. Here you will find photos, details & personal impressions. This photo shows my version of this kit. I built it a few years ago and I am still flying it. If you like building and have some experience with building from a kit or plans, then this model will be a pleasant change from assembling ARF RC airplanes! I get a lot of satisfaction from building from an RC model airplane kit and Top Flite have done an excellent job with this one. The engineering and part production is first class, the hardware is excellent and the flying is a delight. As with all projects, there are a few criticisms but I will let you know about these and suggest a few fixes. I am guessing, but the number of flights on my Stinson Reliant must be close to a hundred by now and still going! The first Stinson Reliant flew in 1933 and production continued until 1943, with the military version. The beautiful gull wing was not used until the SR-7 model and continued through the SR 10 and the military versions. Full details of the history can be found on this Wikipedia page. 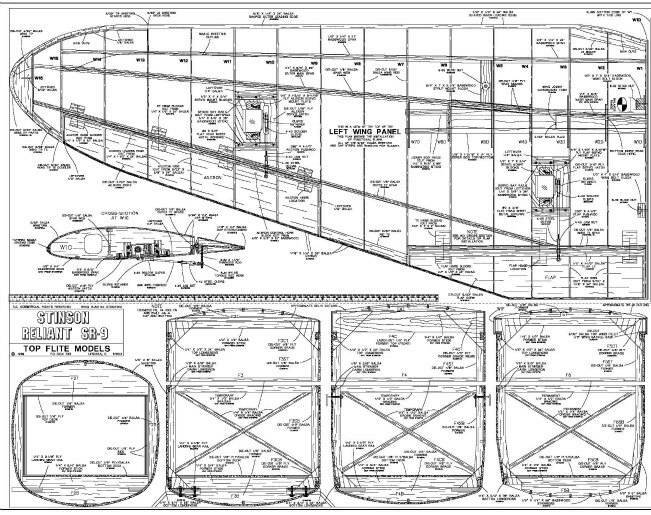 For photo pacs and 3-view drawings, a large selection is available from Bob Banka's Aircraft Documentation. I purchased the William Wylam drawing set, that show a lot of detail. These drawings have been criticized as in-accurate, but they were certainly more than good enough for my needs. By the way, the Top Flite Stinson is NOT super accurate regarding outline. 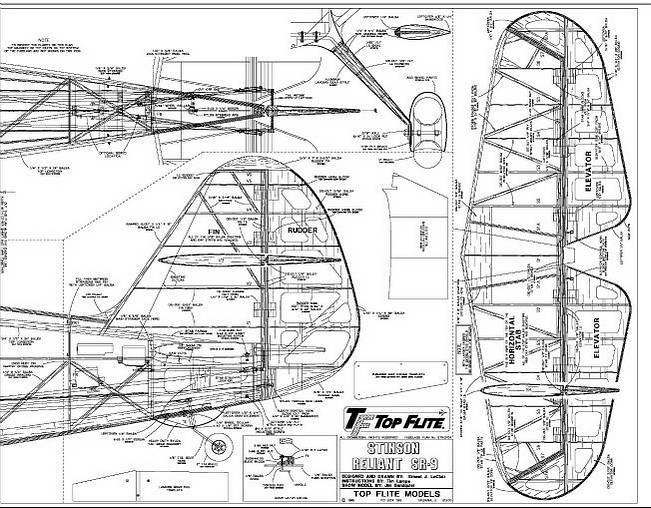 Top Flite mention that, along with most of their scale RC model airplane kits, they are intended to be sport scale and the tail area has been increased slightly and I believe the number of wing ribs is not accurate. However, I cannot tell the difference and the larger tail area contributes to the very nice flying ability! All the balsa required is included in this RC model airplane kit, along with some very nice die cut parts (Balsa and ply), that just fall out of the sheets. The 2-piece aluminum landing gear is pre-bent and the aluminum wing tube and socket are included. A full hardware package is there and some nice decals, including the Stinson logo. 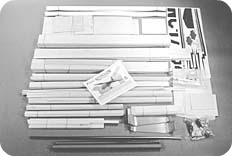 See below for the extra parts that you will have to supply to complete this RC model airplane kit. 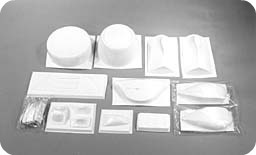 There is a full set of vacuum formed, ABS parts. If you decide to use them, then I would strongly suggest, that the cowl and wheel pants are coated with fiberglass cloth, on the inside. This adds considerable strength to the units and will increase the life considerably. Please note that the two black and white photos were originally shown in the RC Modeler Magazine review. 4-channel radio system-5 channel required if flaps are used. 5-high torque servos for ailerons (2), elevator (2) and rudder (1). 2-standard servos for flaps and 1 standard size for throttle. Pull-Pull cable kit for rudder steering. (2) 5" Dia. main wheels. (1) 16 oz Fuel tank for glow engines. (1) 24oz. Fuel Tank for Gas engines. Fuel tubing, fuel filler valve, foam rubber padding, covering material. Even though the photo shows a Corsair, the radial engine can be used in the Reliant and any other RC model airplane kit that uses a radial engine! This is the one that I used and it worked out just fine. If you are using an RC glow plug engine, then you must use fuel proof paint, to finish the detail. Remember to cut away to give cooling air to the engine cylinders and you must also give lots of area for air exit. I usually allow twice the area for air exit as entry. The interior kit makes into a nice set of seats and a good looking instrument panel. The seats were screwed into position, which made access difficult. Three RC servos were concealed under the rear seat and the throttle servo and the switch are under the front seats. If I were to do it again, I would use magnets to hold things in position, rather than screws. One point to bare in mind, is that it is very difficult to see inside the cockpit! All of your work is hard to see, primarily because there is no transparent roof. 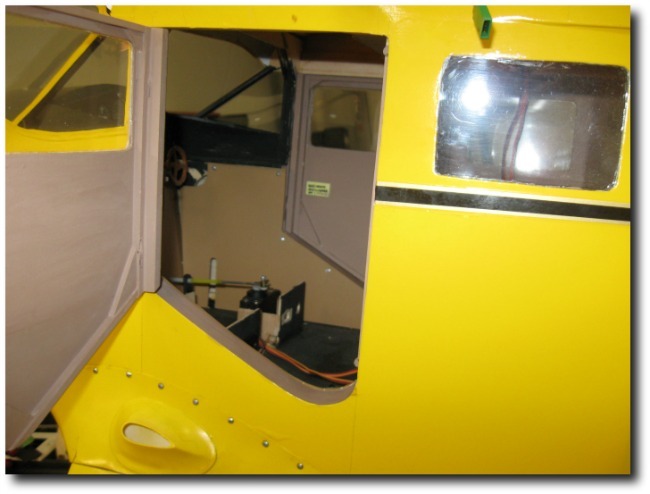 Please note that I made both doors functional, you will need at least one to open, to give access to the wing panel bolts. Power is an O.S. FT160, 4-stroke twin. This is an ideal motor for the Stinson and sounds great! More than enough power and a very reliable motor, that has given me years of dependable service. I decided to cover this RC model airplane kit with Coverite 21st.Century Fabric, with trim cut from Monokote. The decals supplied with the RC airplane kit were also used. After many years of use, the covering still looks excellent and I can really recommend it. It certainly is the fastest way to finish a large scale RC model and looks scale with that fabric finish. Radio is my old faithful JR 10X and the high torque servos are JR 4711.I am not sure if they are still available, but they have served me well! Here we can see one of the doors. The hinges are giant scale flat style and magnets (from Radio Shack) are used to keep the doors closed. The seats have been removed and you can see the throttle servo, that will be under a front seat. This view gives a close-up of the throttle servo. Notice also that I went to the trouble of installing walls, with a brown leather like, Monokote covering. Remember what I said earlier about detailing RC model airplane kits. This was a lot of work that is difficult to see on the finished product, but what the heck!- I enjoyed doing it! 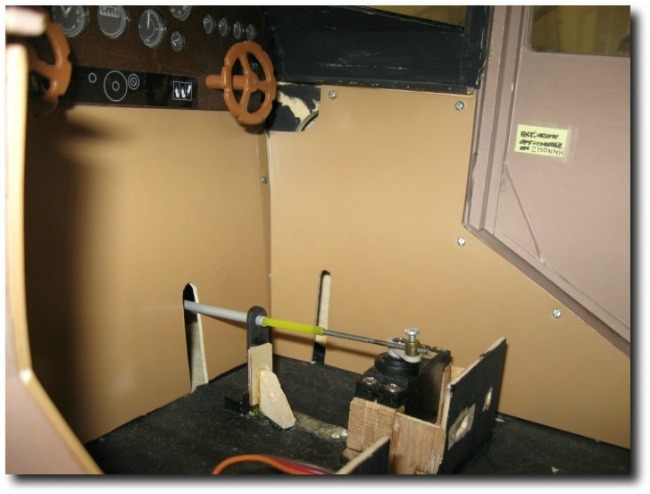 This shot shows the rear seat removed and the rudder and elevator servos exposed. You can also see the RC receiver, held in place with a velcro strap (Available at Radio Shack). Building RC model airplane kits is a big commitment, in these days of ARF RC airplanes, but you will get a TON of satisfaction from this endeavor and comments from your buddies will more than make-up for the long hours spent in the workshop! 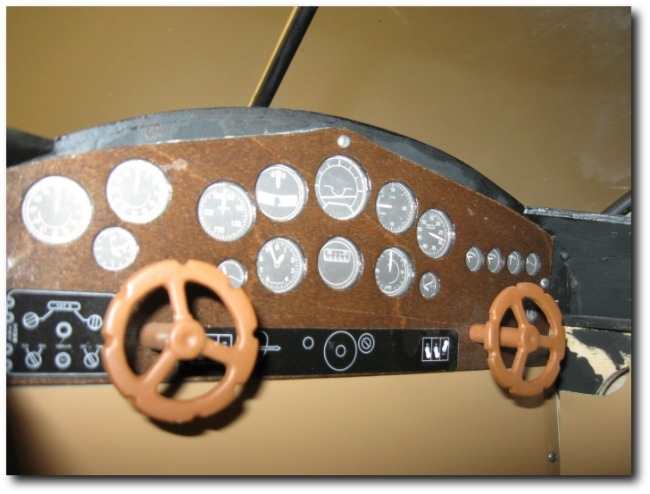 Here is the instrument panel, that is part of the Top Flite Interior Kit. It is not difficult to construct, just time consuming. This panel as well as the wall panel below it, must be removed for access to the tank and battery. This is a good view that shows the front of the airplane. You may be able to see the two remote glow connectors, on the side of the fuselage, below the windshield. These were added and certainly makes things a lot safer, when disconnecting the glow drivers. Also viewable is the landing gear. This has been criticized a fair bit, over the years. It is in two pieces and some modelers prefer a one piece design. It is possible to connect the two sides with an aluminum joining plate but I did not bother. My complaint is that the ply fairing, over the gear blank, cannot extend into the fuselage fairing. If it does then the fairing is going to flex, on every landing and will soon crack and split. I have stopped the ply fairing short of the fuselage fairing, with a gap of about 1/16". This allows the landing gear to flex, with no effect on the fuselage fairing. Note also that I used the fiberglass fairings available from Fiberglass Specialties. Just bear in mind that this is a giant scale RC model airplane kit and it will not tolerate rough landings! Keep those landings smooth and grease her in! A one piece aluminum landing gear, is available from TNT Landing Gear for this RC model airplane kit.. If I were to use this, I would add a 1/4"ply plate, all across the fuselage bottom and bolt on the new gear and add a hatch, so the gear could be removed. It should be pointed out that the struts are completely non-functional, They just slide into the fuselage fairings. This has worked well on my model. 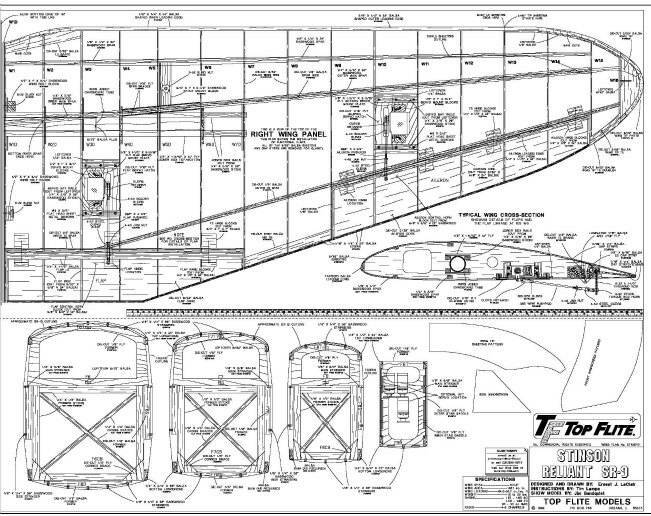 Top Flite include a smaller copy of the plans, as part of the manual. I find this to be an excellent idea! During the process of building over the full size plans, when you need to refer to information that maybe covered up or on another sheet, just refer to the plans in the manual! 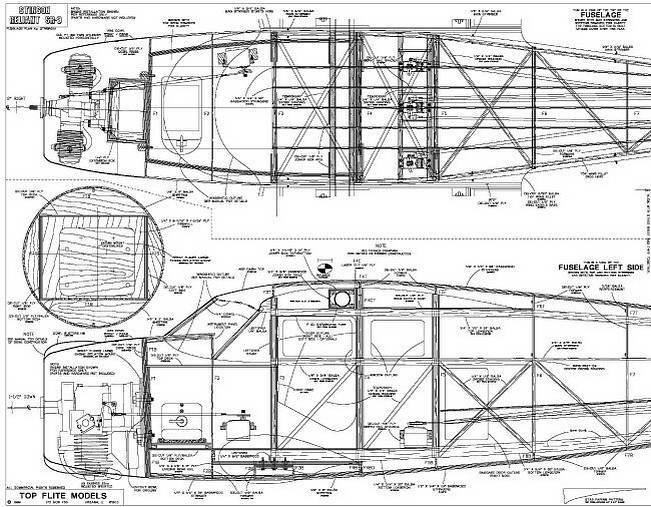 I have included a copy here to give you an idea as to the construction details of the Stinson Reliant. Click here to take a look at the manual. 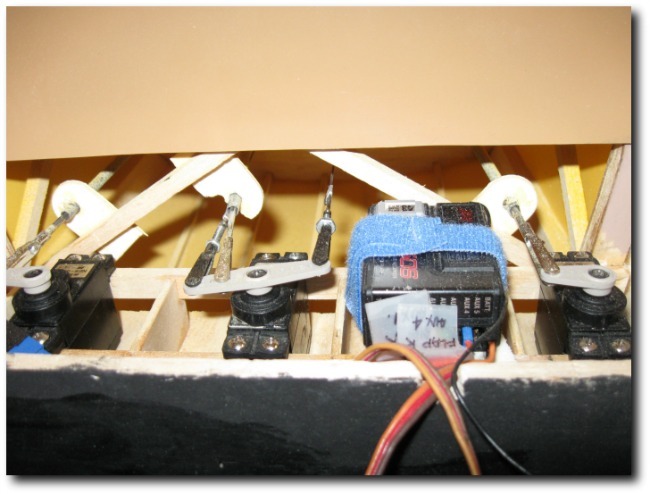 With the weight at just over 20lbs and the balance point as shown on the plans, the first flight of this RC model airplane kit went off without a hitch. She flies really smooth and does need rudder with ailerons, to keep the turns smooth. The flaps work well and do shorten the landing space required, just keep the throttle a little high, to overcome the extra drag. I do not use the flaps, if the wind is high. RC aerobatics are possible, such as the usual rolls and loops but A Stinson doing aerobatics, does not look right! I will fly around in smooth turns and slow fly-byes and try and make the perfect landing. This is one RC model airplane kit, that builds into a beautiful looking RC airplane that just looks gorgeous, just flying around! Very well engineered RC model airplane kit. Excellent manual, with clear instructions and lots of useful photos. Small scale prints of the plan were very useful, during the build, when the plan is covered with parts. Good quality wood, with superb die cutting. East to fly and makes the pilot look good! A lot of building is required but that is also a lot of fun! Be careful with the landing gear-it can break loose on hard landings, or modify as described above. Apart from criticisms of the landing gear, the vast majority of the reviews I have read were very positive. This model has been available for a long time and all the bugs have been fixed by now. Everyone commented on the excellent kit engineering and smooth flight characteristics. This video is very well made and shows a beautifully constructed RC model airplane kit, complete with a superb interior. ( MUCH better than mine!) When I see this video I want to go fly my Reliant! The Top Flite Stinson Reliant SR-9 is in stock. Price=$366.67 with free shipping. Name: Top Flite Stinson Reliant SR-9. Radio req'd: 4 channel or 5 channel with flaps. RC servos req'd: 5 high torque for ailerons, elevator and rudder and standard size for flaps and throttle..